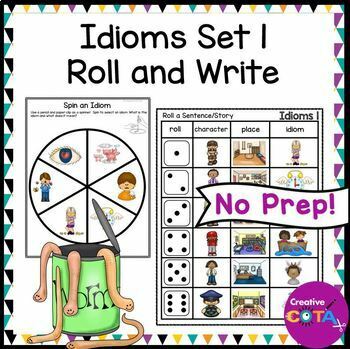 This is a roll an idiom, spin an idiom resource and writing worksheet. 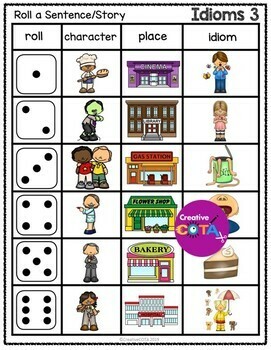 Great for class lessons, writing centers or small groups. The idioms included are… I'm all ears, when pigs fly, time flies, sick as a dog, walk on eggshells, raining cats and dogs, piece of cake, in the same boat, hold your horses, head in the clouds, frog in the throat, fish out of water, cry over spilled milk, cold shoulder, can of worms, butterflies in my stomach and apple of my eye. For some students I find it helpful to teach the idioms using the picture cards before the students complete the roll a sentence activity. 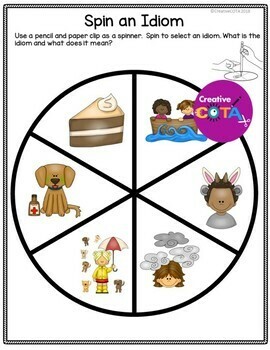 * Copy and Laminate Games, cut out and laminate idiom cards. * Each student takes turns rolling the die to see which part of the story they will be writing. 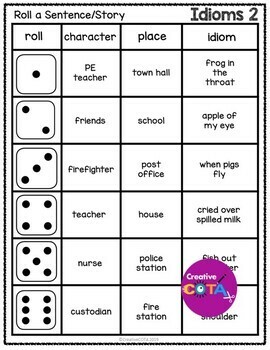 * For roll a sentence they roll 3 times to choose a character, setting and situation..
•Discuss the situations and sentences. What emotions are people feeling? •Use the cards for matching game or make two sets for memory.